After the launch of the portable tools angry ip scanner, enter the desired ip range and the program will scan the address range for participants. Angry ip scanner returns to the detailed analysis, a report of the scans, as well as a list with the found ips back. In the list you will find information about ip address, ping, hostname, and the available ports. For each ip address pinged to check whether this is available. The verbosity of the information with additional plugins will be expanded to the plugins manufacturer's website. The result you may use angry ip scanner in a csv, txt, xml or ip port list file, export and save. 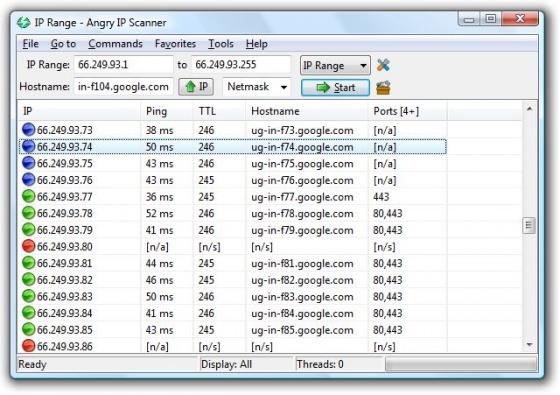 You can free download Angry IP Scanner latest full version from LoadSafeSoft.